A closed alpha for MLB The Show 18 is coming December 22 to stress test the servers and improve the online experience before the official release. Check out some of the details below. The Closed Alpha Test will open December 22nd at 10 AM PDT and close December 26 at 10 AM PDT. UPDATE: (12-21) Some users have received invites to download. Those users can play at 10 AM PDT tomorrow. FYI, just because you haven’t received a closed alpha MLB The Show 18 invite, doesn’t mean you won’t get one. They are sending them throughout the evening. To improve the online experience for MLB The Show 18, we’d like to invite players to participate in an exclusive Closed Alpha Test. The Closed Alpha invites are being sent to players via a PlayStation 4 notification message. You’ll know that you’ve received an invite by a notification pop-up on upper left side of the home screen which when opened will provide you with a link to download the Alpha version of the game. (Check the Notifications screen if you think you missed it). A: No, we’ve targeted a number of players who’ve previously played MLB The Show 17. Q: When should I look for the invite message? A: Invites will be sent out throughout the day of Thursday, December 21st. Q: Can I download the game before the Alpha servers go live? A: Yes. Downloads may begin on Thursday, December 21st (if you’ve received an invite). 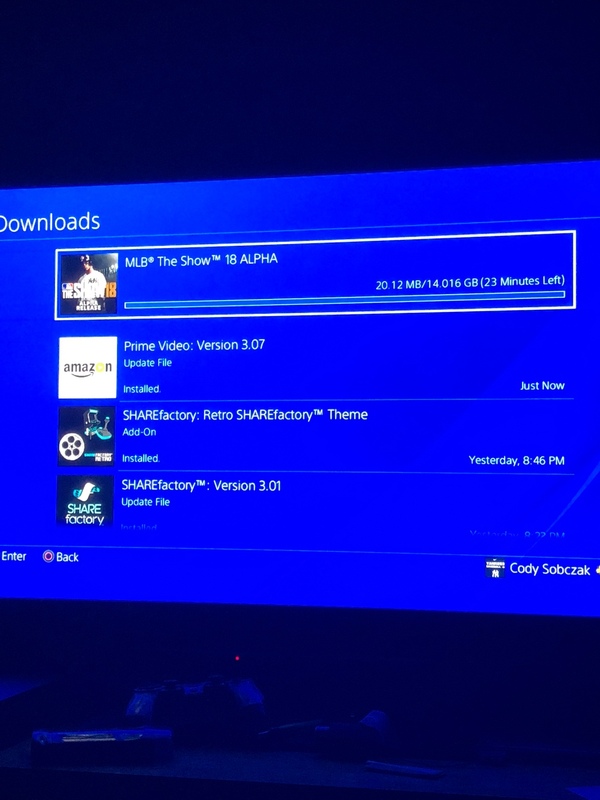 Q: Do I need to pre-order MLB The Show 18 to get invited into the Closed Alpha Test? Q: Is PlayStation Plus required at all to play in the Closed Alpha Test? The Closed Alpha Test will be a limited Diamond Dynasty experience – specifically, the only modes available to play will be: Head to Head, Battle Royale, Conquest, and Extra Innings. You may experience a number bugs, crashes, disconnects, and animation issues. Please remember this is by no means representative of the final product. This is an early build of The Show 18 and we want to work with you to make it the best game possible. We appreciate your support and feedback to help make our game better. A Closed Alpha forum has been created for those players who have access to the game. Please join the discussion and let us know your thoughts! Only those who have been invited to participate in the Closed Alpha Test will have access to these forums. Q: Can I stream gameplay or make YouTube video content, during the Closed Alpha Test? A: No. Doing so may result in your account being suspended from the Closed Alpha, and possibly future tests or release versions of the game. (See: Private Alpha Agreement). Q: Can we discuss our experiences in the Closed Alpha in other forums, communities, or social media? A: No. We ask that you keep conversation about the closed alpha on the closed forum we’ve provided here at The Show Nation. (See: Private Alpha Agreement). 12/21/17 3:05 PM – To clarify: In the stream we said you could create content about your experience in the Alpha. This is no longer correct. We ask you to please keep all discussion of the Closed Alpha Test to the Closed Alpha Forums on The Show Nation. Q: I never got an invite. How can I get into the test? A: The only way to get invited into the Closed Alpha Test is through a PlayStation Network notification detailed above. If you did not received the notification, you cannot participate. Q: Are the player attributes we see in the Closed Alpha Test final? Closed alpha. Big positive step for quality. Running a closed Alpha build starting Friday until the 26th - DD, Battle Royale, Head to Head, etc. only. Want people to focus on hitting. Very intrigued on what tweaks they made. Early server testing is a really good idea. Looking forward to seeing what they've done with the hitting too (if I get in, that is). If they plan on really stress-testing the servers there should be a good amount of the MLB '17 playerbase that gets in on this. Updated OP w/ link and all the details, including Twitch stream archive for those that missed it. Extra Innings being in the beta will allow you to play the CPU, should you get invited to the beta and are interested in doing that. It's also interesting that they said all 30 teams would be in the beta, except DD was going to be the only available mode. Perhaps we'll have straight-up Vs. CPU available too. Meh...no information at all about the new game. Just a notice to enlist some people into testing the online aspect of the game. I think Ramone said the word "servers" about 10,000 times in this 10 minute video. I wonder how good of a server test they will actually get with a non-updated, bare bones version of the game played by only a fraction of the normal users over the Christmas holiday? I mean any QC is better than no QC at all, but I'm not sure it's a fair test either. But if they didn’t do a test and the game launched and the servers struggled then people would complain that they should’ve done a test. People are going to complain no matter what these guys do. I'm certain they have learned that by now. It's a good idea to do more testing, but the timing of this announcement, coupled with the vagueness of what the stream would actually be about ("development update"), and the questionable validity of the test results (will the servers be fine during this closed alpha test? but overwhelmed near release when an order of magnitude more people are trying to use them?) will lead to a good amount of eye rolls. I think if they had not timed this to exactly coincide with the Christmas buying season (pre-orders anyone?) and had simply titled this Twitch event: "Closed alpha test details," that would seem more forthcoming and induce less skepticism from some of us. Even then, who knows how applicable this test, which is not using the eventual build or many of the features/coding/updates, will end up being. What if they do this test and the servers still struggle on release, that would be my fear. And theirs too, probably. Maybe someone with more IT skills can enlighten us there. You'd assume they wouldn't waste their time on a test that is unrepresentative of their usual server demand. They must see some value in it. I just think it’s unfair to complain that the servers are poor and they should try to fix them and test them and then when they do people complain that this isn’t good enough. And now we’re going to question the timing of it and actually suggest it’s being done for nothing more than to get preorders? You’re right people will complain about anything SDS does. And that is a shame. Errr... what the heck is a closed alpha? Alpha is the stage before beta - in other words, an unfinished, unpolished build of what will be the game. "Closed" means participation is by invite only - Ramone said those invites will go out Thursday to those selected. So there’s no way to apply for the alpha? They’re just selecting people based on some criteria from last year? I think you're oversimplifying things a little bit here. Nobody said they're doing this "for nothing more than to get preorders." I am merely suggesting that the timing of this announcement coincides nicely with the holiday buying season. Of course they want to make a better product and avoid the same online ordeals from years past. But, I think it's debatable whether this testing (apples) will do much to ensure the game is working as intended upon release (oranges). I can buy that this is a piece in the quality control puzzle. As for the pre-orders. You can't blame them for it if people will pay multiples of the game's cost before knowing if the game will even be up to par or not. Saying they're marketing the game intelligently to make a lot of money isn't exactly suggesting they're evil, you know. I don't think it's unfair to complain that the servers are poor and I think online people (not me, I am offline so none of that stuff matters to me as a consumer) are right to take a wait-and-see approach after being disappointed for more than one year running. It's not just about '17, it's a track record of that side of the game not getting the same treatment. That they're using the "Domino's Pizza" marketing strategy of "owning up to bad product" doesn't mean it will necessarily be better. So happy to hear this. I really hoped they'd do an alpha/beta this year so this is awesome news. I never said it was unfair to complain about the servers being poor. What I said was that I think its unfair to complain that the servers have been poor the past several years, demand that they try and fix the issue, suggest they do a stress test like other companies do, and then question/complain about them doing exactly what you asked/demanded they do. And you're right, there is no guarantee that doing this beta will equate to a problem free launch of the servers or a better product. But you know what has been proven.....not doing a beta/stress test. I'm sorry, I don't see how this can be viewed as a negative or as anything more than the SDS team trying to improve their product. The community asked/demanded that SDS step up and work harder to improve the servers, and from where I sit that is exactly what they are doing. For sure, tests of this scale wouldn't really help how the their servers hold up against the load spikes expected for the new game coming out, but the baseball gameplay part of online has always been mostly peer-to-peer, so I think it would still help better fine-tune the gameplay experiences due to in-game lags and such... besides, it is at least a chance to provide early enough feedback to see how the game is shaping up, which cannot be a bad thing at all. However, I think the weakest part of online experience has been unresponsiveness/unreliability when our game goes off and try to get information in sync with the servers where they keep our game history and online records and such (or when we wait till getting matched against another online player... all happen when their servers act as a sort of broker of information)... and issues like these only get worse unless the system itself is designed to be scalable, which I think it has never been before. I'm afraid the closed alpha like this wouldn't involve enough users to put heavy enough stress on the system to have issues come out like we see around launch time after the release. Hope that the devs are able to do better jobs in that regard the next year though. The online fiasco has gotten painful to watch the past couple years. Hope I made the list. I hope they just don't target people who played a lot of online games. I don't play online because of the lag and cheese, because of lag. If they target people whose "PING" has been great, it will defeat the purpose. I'm eager and anxious to see what people in the alpha test think of the hitting. I'm curious to hear what is different and the overall feel of it at this time. Sweet Moses Malone, please let it be Hitters Eye! I applaud this move but isn’t this like the 3rd or 4th time they completely started from scratch with the server code? A: No. We ask that you keep conversation about the closed beta on the closed forum we’ve provided here at The Show Nation. (See: Private Alpha Agreement). Many years overdue. Good to see. I can definitely believe SDS is focused on getting their servers fixed for a better online experience but I dont see anything from the twitch stream that indicates offline will get less emphasis. But that might be because I'm a ''the glass is half full'' type personality more than anything SDS has done. Yeah I’m not sure how we can read more into this than what it is, a closed alpha to test the servers and to provide feedback on their hitting at this time. I think the logic makes sense though. We've gone over this on OS time and again (with the critics vs the white knights and their eternal struggle for supremacy) about how SDS is a small studio with a limited number of resources and can't be everything to all people. People should set their expectations realistically etc. If they are intensely focusing on one area of the game (like DD), it stands to reason there will be another area that is not as much of a focus. While they can make more than one improvement, it's been established ad nauseum that they only have so much manna that can be tapped in a single turn. Aside from that, sacrificing offline for online modes has been an ongoing trend for a few years. That since they are doing a stress test on the servers then that means they obviously neglected other aspects of the game? The logic is that, as Ramone has stated himself, the development team has certain focal areas they prioritize in each cycle. They can't re-do the entire game from scratch each year with the resources they have. They have stated that certain modes etc have gotten the lions' share of attention in recent cycles. If they are worried about connectivity/servers/online this time, it stands to reason that will be one of the areas they work on the most. So, let's wait for more information to see what else has been upgraded and what has been "neglected" to use your words. I'm not sure it's healthy for you to keep acting as a human shield for criticism about this game. This gets really repetitive. Year after year. Think about it this way--posts that are critical of their product and/or process can actually be useful as long as there is some logic, hopefully a constructive/educational aspect, and it's not a personal attack. Feel free to respond to this, but in the interest of avoiding another white knights vs critics thing, this will be my last words in this thread. I understand that. I was just trying to understand what logic you were referring, as Caufield responded that this alpha test was a sure indication that they didn't put any focus onto other aspects of the game. I thought you were stating that logic makes sense. I was confused as you made that comment, then ended your post by saying we'll know more when the fact sheet is revealed most likely next month. I was only trying to seek clarification on what logic made sense. Come on WTNY, you're better than this. ^ Was about to post the same thing re: the second quote. CB's not "white knighting" - he played '16 for most of the 17 cycle IIRC. We're ALL better than that. I am very happy about this alpha test. I would love to have stable servers so I can play my friends in DD. I love that mode. But I abandoned it on 17 after logging well over 100 online games on 16 in that same mode. Online 16 was 100X’s better than 17. This needed to be an area of focus. But in no way is this any indication that offline got no love. Hell no. There is a team dedicated to offline franchise. Yeah, the waiting game anxiously hoping for a patch to fix that issue was indeed a tedium, haha. But it was worse the way the ball physics was tuned back and forth without any notice... it became a cat-and-mouse game of looking for what has been changed before even trying to fine tune sliders to the MLB ave. Overall MLB 17 was still a good game and was an improvement over previous iterations, but I anticipate ball physics will be getting some tuning, given all the feedback we've seen about it. Hopefully there won't be any major offline issues for the new game. I’m getting a error every time i try to download it . Edit nvm , restarted system and it’s downloading . Only 30 minutes left ! i bet they chose mostly the top ranked players in DD. so if you aren't up there then don't really expect a invite to it. Possibly yeah, although that would be another awful PR move. I put a ton of time into DD this year. I'll be bummed if I don't get one. Not to mention having played The Show for the last 10 years. Everyone should get it in my opinion. I played DD maybe 25-30% for 17. Primarily Franchise . Your thoughts to what ? The OP I quoted said top DD players and I never rose above the division series and even stated I played franchise more . I’m clearly missing the point of your comment . I think they meant to quote Philliesfan. Your info gives me hope as I'm somewhat in the same position as you as far as my DD progress went...lol. Haha no worries man , I figured it was a reply to my comment which confused me . All good ! Also for the record I did play 17 this morning for the first time in about 2 months, so I don’t know if that had any influence to it . But i have also been playing the show since the 06 with Ortiz on the cover . I had the invite for this pop up on my screen while I was playing GTA about an hour ago. Nice surprise. I can't recall them ever doing anything like this for the Show. FAQ updated. Make sure you read it, don't get yourself banned. I think this is nice concept of what SDS is offering for players input on certain. Exceptionally a hands on experience. Good luck to everyone who is chosen. Pretty much: DON’T SHARE ANYTHING ABOUT THE EXPERIENCE outside the Official Show Nation Alpha forum. I was shocked when i logged in to see a mlb the show 18 alpha notification. For years i always said this series needed testing by the community before the game comes out. I received an invite as well. I'm a little shocked and also honored. And excited. I received an invite as well, surprised indeed. I'm just gonna come right out and say it. I'm salty as hell that I didn't get an invite. But hey, at least I'm being honest about it. im in hope to play some OS brethren this weekend! My brother received a invite as well. He played mostly DD in 17. No luck this morning either. It’s sad since I was well sat in the hype train. I Even launched TS17 for the first time in months this week. Nobody should have been shut out from this. If you played The Show 17 you should have gotten one. Especially fans who have been loyal to the franchise from the beginning. And yes, I would still say the same thing even if I got an invite. This is bad PR. Ok going to fire up the Pro here in 20 minutes. Fingers crossed. I don't see how this is enforceable at all. It's the internet, people talk. Got an invite and I mostly play franchise offline. Played a little DD, but not a ton. I'm extremely curious to know what changes they made to hitting this year as that was an issue I had with the game in '17. The pitcher/batter interaction just seemed off compared to '16. Really wish I hadn’t entered my code to download it now that I think about it .. Had I known some good folks in the Show community weren’t gonna get one I would’ve gave mine to one of them . I love the show and it’s my favorite but I know some guys who actually have helped make this game more enjoyable for me to play. That’s messed up that of all people you didn’t get one. According to multiple reports on Reddit, it looks like Canadians were left out of it. If it turns out to be true, it’s another PR/community management fiasco. its probably the same routine that is with the giveaways they do on the streams. no one outside of the united states can win anything. I dont think SDS has a choice in the matter, its what is told from Sony them selves. Not going to take it personally at all. It would have been cool. But regardless, I am really looking forward to 18. Year in and year out it is the very best sports game. Fiasco? Lol that’s a bit strong. No invitation to the party, picked the wrong year to be not fond of a version. Armor and Sword should have got an invite. I use his sliders and it has made the game more enjoyable for me. I have bought every single version of this game every year even before it was even called MLB The Show. I get that selection is "targeted". It does feel a bit off that I practically play this game daily for hours on end and two friends get the Alpha invite. One only owned '17 for two months and then traded it in. LOL. It's definitely not going to keep me from buying again this year in March or anything. I mean, this is only part of the game, and it's nowhere near the finished version and is missing content, but I always want to get my hands on the latest version as soon as I possibly can. And I do agree with Philliefan13. The invite should have been for everyone who played the game. At least for those who played The Show '17 in online modes at least a few times minimum, and specifically those players if that's what they were trying to go for in terms of testing. I think....in fact I know it had to be completely random. I will look forward to the finished game. In the meantime I am still jamming 17 and having a total blast offline in my franchises and classic seasons. Glad I didn't get the invite. I saw many troubles coming about for myself after spending the whole holiday playing games. kinda stinks we wont be able to hear from those who participate in the test but I undertstand its for good reason. I dont want that alpha test. I can make my own alpha test. yeah, thats right, I got 'em all. Bad PR for not getting an invite to a small group of people privy to something this series has never offered before? You can be angry you didn't get an invite but it's naive to think its realistic for them to open it up to everyone. Them openong a closed alpha to some of the general public is the opposite of bad PR regardless of how people were chosen. I just saw I got an invite yesterday, I'm just seeing this right now I didn't log on yesterday....I wonder if it's too late? You cannot provide impressions nor answer questions on the alpha. The only thing permitted is to provide feedback on their website/forum. This thread needs to be closed! No offense to anybody. We all didn't get invited to the community days either. There is no reason for being upset. I am surely some of the guys are joking around. In all due respect, why would you close that thread? No one has been disrespectful and no one leaked any info. Is it because some people (including myself) criticized SDS? I don’t think that should be a good reason to close threads. I stand by my criticism by the way, and still think it’s a PR/community management fiasco. The word fiasco might be a bit strong, but I don’t know another word to describe it (English is not my mother language). The end result is that some people who watched Ramone’s stream, who cares about the game and had time to provide feedback have to resort to watch 13 yo boys “illegally” streaming the game on twitch instead of playing it and provide feedback. ^^that is what I call a poor PR/community management choice. A simple form to register for alpha would’ve alleviate this. Even if they put out of form for people to register for a chance to be in the alpha, not everyone would've gotten in, and you would still have the potential for 13 yo boys to be in the alpha. I understand people are frustrated they didn't get picked or invited to be in the closed alpha, but the criticism seems to come from a view point of sour grapes more than anything else. Again, I ask, bad PR how? This is not something they've ever done before. Was it bad PR last year (or every other year for that matter) when they didn't open up a closed Alpha at all? Geez. Last year pitchforks were out. THE COMMUNITY NEEDS TO TEST THE SERVERS PRIOR TO RELEASE!!!! This year, they allow that and now the complaint is that you weren't part of the chosen to test the servers so it's bad PR? Remember. This closed alpha is in no way shape or form meant as a demo or for you to get the play the game early. That is NOT a right anyone has. This is solely to test the servers. Doesn't matter if the users are 13 or 70. It's about the number of people online at a given time. Not about who gets to see and play the game early. I tried to read through for the answer to this question: Were the people chosen for the closed alpha just those that played the game online? It does not matter how people were chosen. What is important is that the people chosen offer insightful feedback that gets the game back to playable online. I am hoping that people are not using it as a means to just play it and offer nothing. As I said yesterday I was chosen and have played the Alpha now, I can't speak on it but there is not a lot there to be upset about. It's a limited alpha in early stages, only being able to test Diamond Dynasty also does not leave much room for impressions. I think them not releasing it to everyone was a good idea, you see what happens here every year with impressions when a game drops. 500 people will talk about it but only 20 of them make any sense....same thing with this. It would have gotten messy. Definitely agree this is the complete opposite of bad PR. I'm guessing they took a large number of members in the community to test the alpha. My guess is SDS is trying to get feedback on the hitting engine and do a minor stress test on the new server technology that they have for next year. I would guess those are the 2 main areas of focus. As you mentioned every year (for at least the 4/5 years) there is community outrage that the game is unplayable online at launch. And I have seen from reading Twitter and watching streams all this year the hitting engine was horrible to most of the community, especially when it came to just being 'just late' on every pitch. Gotcha. I didn't watch the stream because I was out and knew I could catch up on Twitter shortly after. Obviously Twitter didn't give me all the details. I'm thinking that even the people who are only using as a means to just play it are offering some insightful feedback in the form of stats. I'm sure SDS is following all the numbers closely and that is the reason it does not matter how people were chosen. I hope I'm right about that. I'd really like to provide feedback, but I can't access the forum and I can't get anyone to help me out. Just checked my ps app on my phone and saw that I was selected for the closed alpha invite. I would have loved to participate but I am out of town on vacation for the holidays and won’t be able to participate. I think the closed alpha is a great idea and hope it can lead to some great feedback so the online portion of the game is improved. Lol. I thought of that as I pressed the send button. Just so everyone knows, there is no code. Just need to download from the notifications section of the PS4. I had a code. It took me straight to the PS store with that 12 digit code already automatically entered for me. That's how I downloaded it. Oh ok. I didn’t know since I left for vacation on Thursday and didn’t go through the process. Good to know. Got the invite......but waay busy with family the last few days, haven't played at all. Would have loved to get some solid feedback but the timing of the beta was just bad. This is my thought as well...the online servers have honestly just been trash the past two years at launch - we know it, they know it - so this is an opportunity to have a lot more eyes on it than just their QA testers. Perhaps they are wanting to test new features (franchise?!?) but my instinct says it's purely to load test on their online servers. I think this is a great move/idea for their team and for us, the end users. Their team gets valuable feedback from (hopefully) fans of the game, we get a better game at launch that hopefully should be rid of the issues that plagued the last 2 years. EDIT: This is presuming that the alpha is centered around online functionality. I'm with you on the timing as well. I got home from my vacation with the family last night and wasn't able to play the alpha. Hoping those that did were able to give some constructive criticism and really stress the servers. The more I think about the alpha and how they want to have no one talk about it makes me think due to its early stages there probably hasn't been a whole lot changed just yet or some of the things that are, aren't working 100%. After the last couple of years, they can't go through the mess that this game was in the first month of release again so kudos to doing this. Major step forward. There was plenty of footage on YouTube from the closed alpha, for those who didn’t get to play it.